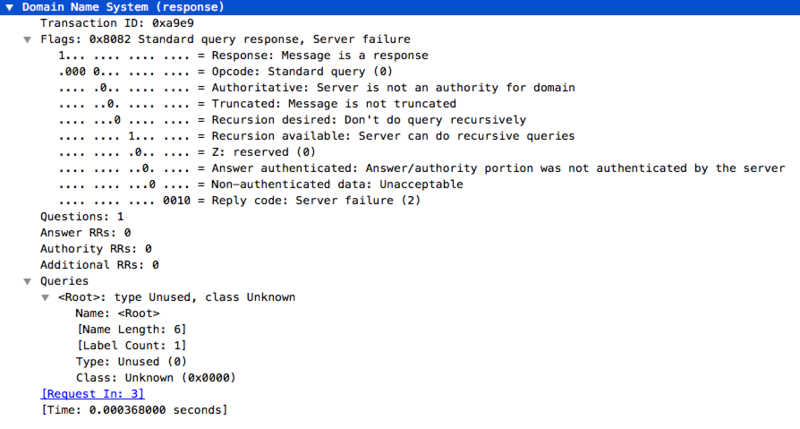 We have recently started receiving an odd DNS request that causes the PowerDNS Recursor JSON stat HTTP API to throw an exception. Here are the bytes of the DNS query that we are receiving (application layer only). It is ostensibly coming from some Fortinet security product. 0020   31 08 66 6f 72 74 69 6e 65 74 03 63 6f 6d 00 00   1.fortinet.com.. Here is an image of the Wireshark details of the request, which may be easier to read. curl -H 'X-API-Key: our-api-key' "http://127.0.0.1:8082/jsonstat?command=get-query-ring&name=queries"
For the record, the error is raised here in the source code. I have been using the following Python script to reproduce the DNS query. You must sudo pip install pyip first, and run the script as superuser. There may be an easier way to reproduce with dig, but this has worked for me. Ideally there would be no exception thrown. Perhaps the 'unset DNS name' gets represented as an empty string. Although that could cause some ambiguity. Perhaps PowerDNS should respond to this query with Format Error flags, and not ultimately place the query in the ring buffer? See my comparison of the PowerDNS and Google DNS responses at the bottom of this issue. HTTP ISE for "/jsonstat": STL Exception: Attempt to print an unset dnsname appears in pdns.log, and the HTTP request receives a 500 Internal Server Error. I was curious to see how PowerDNS actually responds to the query, so I compared the response from my local Recursor to the response from Google's DNS at 8.8.8.8. 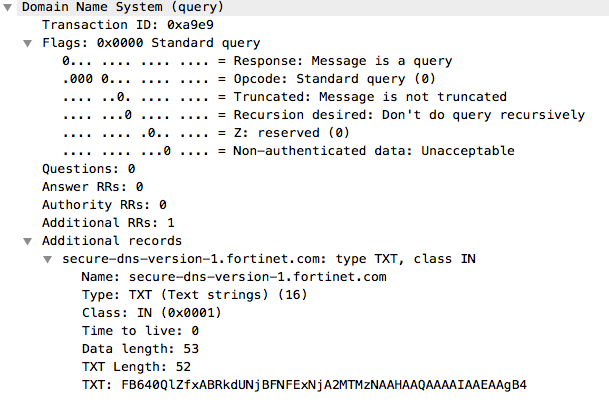 Google DNS gave a response with flags indicating a format error in the query, which you can see in this screenshot of the Wireshark details of the response. There are probably a few places that could use toLogString instead which prints <empty> in these cases instead. I can probably poke around at that part this week while the smarter people come up with a better fix for handling these earlier on. A quick check shows rec_control top-queries breaks as well for instance. Other ones like current-queries were previous patched to use toLogString though. This is an outstanding bug report by the way. Thank you so much!